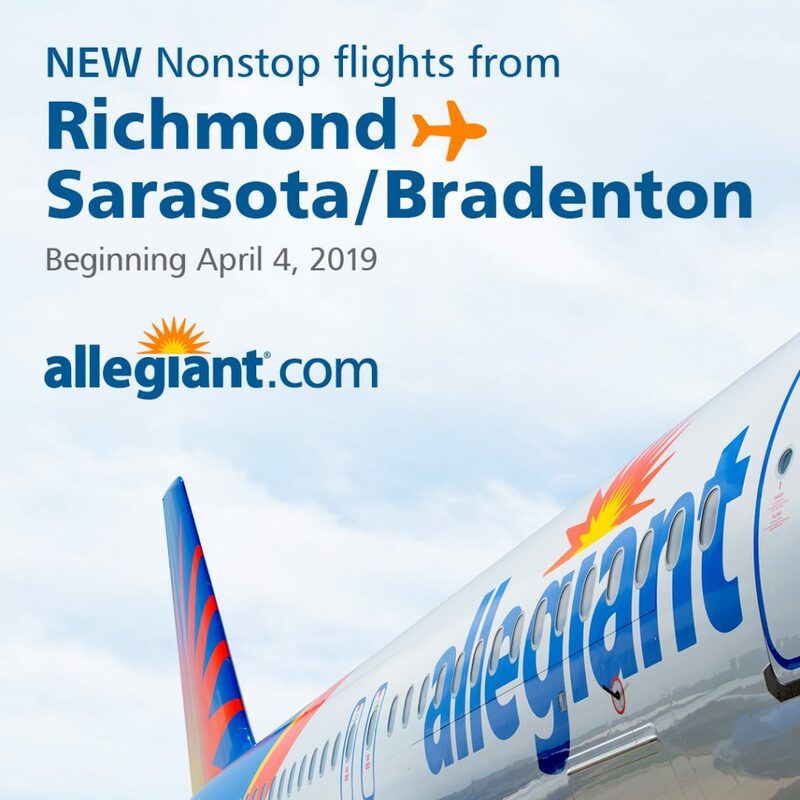 Richmond International Airport, VA (April 4, 2019) — Allegiant begins service today from Richmond to Sarasota Bradenton International Airport (SRQ). To celebrate, the company is offering fares on the new route as low as $55 each way*. Price displayed reflects purchase of a round-trip itinerary and includes taxes, carrier charges and government fees. Seats and dates are limited and fares are not available on all flights. Flights must be purchased by April 6, 2019 for travel by May 30, 2019. Price displayed reflects purchase of a round-trip itinerary and includes taxes, carrier charges & government fees. Fare rules, routes and schedules are subject to change without notice. Optional baggage charges and additional restrictions may apply. For more details, optional services and baggage fees, please visit Allegiant.com. Las Vegas-based Allegiant (NASDAQ: ALGT) is focused on linking travelers to world-class leisure destinations. The airline offers industry-low fares on an all-jet fleet while also offering other travel-related products such as hotel rooms and rental cars. All can be purchased only through the company website, Allegiant.com. Beginning with one aircraft and one route in 1999, the company has grown to over 80 aircraft and more than 400 routes across the country with base airfares less than half the cost of the average domestic round-trip ticket.